The former Vice President, Atiku Abubakar, has emerged as the flagbearer of the Peoples Democratic Party (PDP) in the 2019 presidential election. Atiku beat 11 other contestants after polling 1, 532 at the crucial National Convention in Port Harcourt, the Rivers State capital. Sokoto State Governor, Aminu Tambuwal came second with 693 votes, Senate President Bukola Saraki polled 317 votes, while the immediate past Senate President, Senator David Mark 35 votes. Gombe State Governor, Ibrahim Dankwambo 111 votes, Sokoto State Governor, Aminu Tambuwal 693 votes, former governors of Kaduna, Kano, Sokoto, Jigawa and Plateau states- Ahmed Makarfi 74 votes, Rabiu Kwankwaso 158 votes, Attahiru Bafarawa 48 votes, Sule Lamido 96 votes, Jonah Jang 19 votes, former Minister of Special Duties, Tanimu Turaki 65 votes, Datti Baba-Ahmed 5 votes. 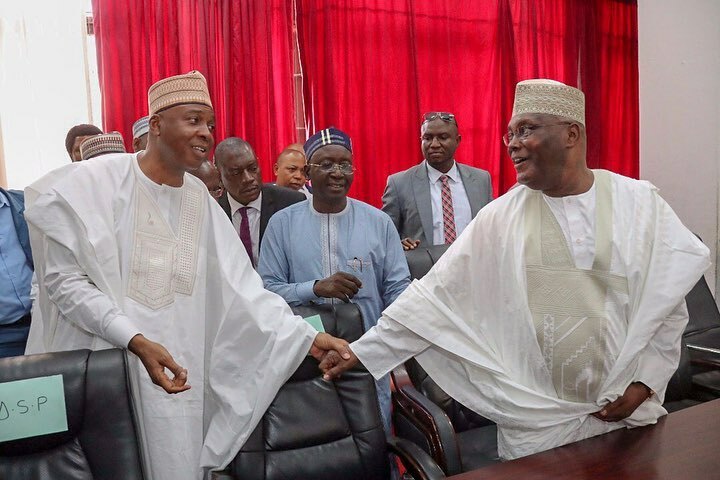 Atiku will go up against incumbent president Muhammadu Buhari of the All Progressives Congress for the nation’s top job next February.